PPI Claims Management Company Ltd (trading as Lion Claimline) have recently been the cause of a complaint to the Advertising Standards Authority, the UK’s independent regulator for advertising. The complaint was upheld and centred around the wording on a marketing email sent out by Lion Claimline. The full adjudication can be read here. The issues concerning the complainant were two fold. Firstly, the company claimed in its marketing email that it only sends emails to people who’ve provided their permission to receive them but this was a claim that couldn’t be verified and was therefore considered misleading. And secondly, this therefore made the email unsolicited and therefore in breach of the CAP Code. Lion Claimline claimed the email addresses came from a 3rd party lead provider. The ASA deemed this was still a breach and Lion Claimline have been advised that they must not send solicited emails again. 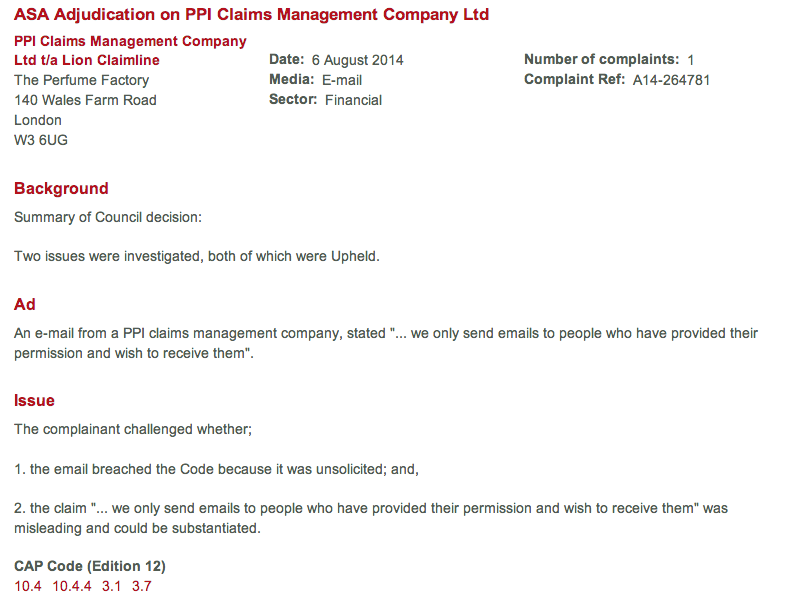 Lion Claimline are far from the first PPI claims management company to have a complaint against their advertising practices upheld by the ASA. You can see 13 complaints (at the time of writing) about advertisers in the PPI space since 2010 here. 12 of those were fully upheld. The complaints visible on the ASA website include multiple complaints about text messages claiming things like “We have your records and can see you are owed £3,250,” and so on. All UK advertisers, not just those in the PPI claims space, are expected to adhere to the CAP codes that can be viewed on the official CAP website. Posted on August 14th, 2014 in Reclaim.